So Dave opted for bigger bags of chips versus the more wasteful one-serving bags — and cut out packaging wherever he could. Buying used items on Craigslist, composting food and paper scraps in his worm bin, and shopping at the farmers’ market — where he could even take back his egg cartons to a farmer for reuse — helped downsize Dave’s trash pile. Plus, recycling tends to be a loosely used term, according to Dave. “Take plastic water bottles. they’re not actually recycled, they’re downcycled. They’re turned into park benches and plastic wood and things like that. Recycling is turning something back into itself. With plastic water bottles, you need relatively virgin plastic resin, so as far as the next generation of plastic bottles goes, recycling’s not doing anything.”� Recycling’s still better than sending things to the landfill, but isn’t a guilt-free eco-parctice, Dave says. See Dave display all the trash he amassed in the short video above. 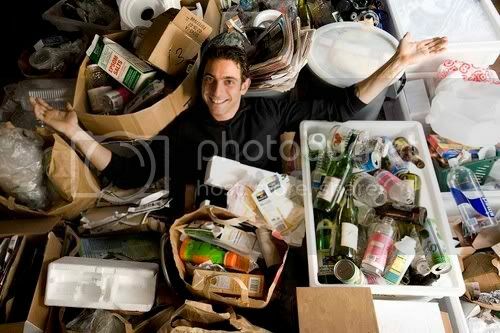 The trash-collecting experiment ended Dec. 31, 2008, but Dave expects most of the habits he picked up during the year to remain permanent. “I got rid of all my junk mail — I’m not going to go back to having junk mail, obviously!”� Dave says. He’ll also keep taking his own bag to the farmer’s market — and even taking sugar packet wrappers home to feed to the worm composter. And Dave’s collected trash is going to become a permanent fixture too — at the Museum of Trash in Hartford, Conn., which will put Dave’s 30.5 lbs of non-recyclable trash on exhibit later this month. Dave’s recyclables are going to become art as well, thanks to an artist in Seattle who wants to pulverize everything then create something new out of the remains.